British Dealer Team Vauxhall had been common place in the UK in the 1970’s, however it is not widely known that in 1977 a Dealer Team Vauxhall Denmark was established. The team was managed by prominent Vauxhall Dealer Jorgen Frederiksen of Holboek. The Drivers were Jorgen Binder and Flemming Laubjery for rallies and Holger Knudsen and Soren Landrolsen for races. The drivers supplied their own competition and service vehicles. Starting money and bonuses were paid to the drivers who paid all other team expenses. The team was very successful from the start. Holger Knudsen was the runner-up in the Danish Championship with his Group 1 Firenza 2.3 and Flemming Laubjery won the Danish Rally Championship with his Group 2 Chevette 1.3 Hatch Back. 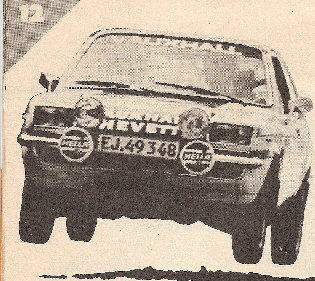 In 1978 the decision was taken to just concentrate on the Chevette 1.3 and new for the team 2.3 Rally Cars with drivers Jorgen Binder and Flemming Laubjery.